In 1953 following news of Stalin's death inmates in gulag complex in Vorkuta struck in protest of their conditions. In response the Soviet Authorities violently crushed the strike. Prison camps were set up in Russia by the Bolsheviks soon after the October 1917 revolution and the scale of imprisonment expanded enormously beginning in the late 1920s, with most prisoners forced to labor, especially in mining, logging, and construction. From the 1930s through the mid 1950s, camps around the country contained millions of prisoners (from common criminals to political prisoners such as dissidents and opponents of the regime) working in inhumane conditions. Many died due to overwork, extreme climate, disease and malnutrition. Due to the arduous conditions and brutality, effective resistance was extremely difficult to organize. The 1930s hunger strikes were largely unsuccessful. In the late 1940s, a major armed revolt involving tens of thousands of prisoners was brutally repressed, with nearly all participants being executed or dying in combat. 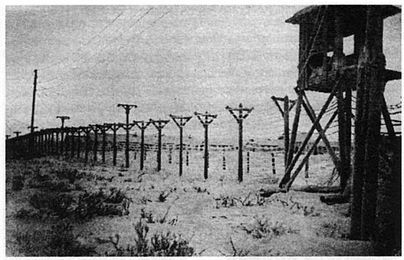 The Vorkuta Camp was one of the more notorious forced labor camps of the Gulag. Established in 1932, it officially engaged in the construction of coalmines, coal mining, and forestry. Unofficially, it was one of the new regime’s preferred sites of political cleansing. It was at Vorkuta, in 1937, that the Stalinist regime liquidated the Trotskyist Left Opposition. In 1946, Vorkuta housed 62,700 inmates, a number which had fallen to 56,000 by July 1953. A substantial portion of the camp guards were former convicts. Due to its economic (mines were the central powerhouse for Soviet industrialization) and political importance, Vorkuta had one of the best security systems and prisoners were the subjects of intense surveillance. The 1953 strike would therefore have to overcome two main obstacles: not only an almost certain and brutal repression by the camp administration, but also the lack of solidarity between the inmates, exacerbated by the camp authorities’ continuous efforts to exploit and aggravate the rivalries and rifts between nationalities (for example, camp administrators recruited brigade leaders or even guards from the ranks of certain nationalities to ensure the inmates did not become a cohesive social group). Despite hatreds, rivalries, and contentious ideologies, a period of ungovernability was sparked by the appearance of clandestine organizations, such as self-help organizations aimed at the physical protection of inmates. The authorities adopted several measures (including material improvements of inmates’ life in the camp, large-scale transfers between camps to stop the new clandestine organizations from taking ground and limiting the solidarity between workers, and separating the political from the common prisoners) which, although successful in the short term, soon became the preconditions of the struggle which followed. In the long run, these measures achieved effects opposite to the desired ones, by accelerating the “anti-totalitarian” ideological evolution among the prisoners (already stimulated by material conditions) and strengthening the clandestine organizations and prisoner solidarity. At Vorkuta, clandestine organizations were represented on three levels: the political (prisoners created “parties” in the camps, even during the strikes or other such disruptive activities), the informative (run by intellectuals and invalids, who read newspapers and other material available and tried to obtain information from Western radio broadcasts through contacts with free workers and prepared bulletins about the Soviet as well as the international situation) and the military (run by ex-officers). What connected the organizations at Vorkuta with other similar ones was the plan for a military insurrection to take over the camp (and then extend to liberate other camps). The ultimate goal of all clandestine clamp organizations was the destruction of the Soviet regime (presumably, with Western help) and the restoration of the pre-1939 situation. As early as 1950, the organizations in the camp began demanding a just distribution of work and the improvement of labor and living conditions in Vorkuta. The authorities refused this demand, with the result that entire prisoner brigades began refusing to go to work. By mid-summer 1952, worker insubordination was so widespread as to cause complete disruption to the work plan assigned to the camp. It was in this climate of growing tension, that strikes broke out in several camps around Russia. Several authors note that the strikes might have been triggered by the tension itself, which made the guards react with unusual harshness to any “anomalous” behavior in the prisoners, and made the prisoners react quickly to any abuse. In Vorkuta in particular, the escalation towards the strike was influenced by rumors about Stalin’s declining health and the prisoners’ belief in an approaching demise of the Soviet system. These rumors, as well as the general context in the work camp world seemed to produce changes in the guards as well, since they were not only quick to shoot at almost any sign of disobedience, but, paradoxically, dialogue between guards and prisoners, especially of the same nationality, also increased, feeding the faith of prisoners’ that a significant number of guards would switch sides in the event of an uprising. In March 1953, Stalin died, sparking a wave of disbanding among authorities and unprecedented euphoria among prisoners. In camps all over Russia, including Vorkuta, messages started appearing on barrack walls and latrine doors, demanding higher salaries (where these existed), better working conditions and lower production norms. About 1.2 million prisoners were released (mostly common, not political prisoners), balanced by only about 600,000 new arrivals. Soon, normal events, transformed by the tension and the high political stakes into dramatic events, gave birth to great strikes. Until the end of June, despite the prisoners’ intention to go on strike at the announcement of Stalin’s death, the situation in Vorkuta had remained one of apparent calm. On June 17, news of the Berlin revolt broke out (East Berlin workers had come out in a strike against the Communist rulers - the first strike to have occurred in a country under Russian occupation), which convinced the prisoners to abandon their dreams of a military insurrection and do something themselves. The solution unanimously accepted was a mass strike. A few days later, news of high-ranking Moscow officials’ falls from grace weakened the power structure in the camp, by making authorities believe they, too, would soon be called to answer for their actions. The transformation of the clandestine organizations and their plans was almost complete by July. They were able to communicate regularly from one camp to another and “strike organization committees” had been at work for at least two months. With strikes breaking out in other camps, Vorkuta joined at the end of July. The first strike committee that had declared a strike (at the number 1 mineshaft) was immediately arrested. However, work stopped in various other points of the camp and messages (either written on wagons or on walls) announced the initiation of a camp-wide protest action. At the end of July, four of thirteen camps within Vorkuta, with three to four thousand prisoners in each, were on strike. The mining workers had also been joined by workers that were building the new power station for the mining complex. The authorities started frantically introducing improvements (the removal of bars from barrack windows, of padlocks from the doors and of numbers from the uniforms) in the camps not on strike, thus making concessions that had not even been asked for yet and making their weakness apparent. These measures only served to increase the prisoners’ excitement and they began tearing down railings, ripping their uniforms and joining other camps on strike. The strike took different forms in various places within Vorkuta, with the prisoners either simply refusing to go to work and/or to turn up for parades or inspections, or locking themselves up in the barracks or in the workplaces. A strike leaflet appeared by the thousands of copies, urging self-reliance to gain freedom and the strike as the only possible means of action. Sympathetic soldiers helped spread the leaflets and maintain contact between the various camps in Vorkuta (Russian speaking troops were quickly moved and replaced by guards or soldiers who did not speak Russian). Initially, the authorities responded with politeness and speeches announcing more improvements and underlining the importance of the prisoners’ work for the economy. Soon, however, a few camps on strike were surrounded by nests of machine guns, and although the solidarity of the majority of the guards with the prisoners’ was apparent, tension began to increase. Strikers were provided their rations as normally, dialogue with the officials continued and Moscow promised to send an official commission to investigate the matter. When the commission finally arrived, the prisoners stood solid, refused to be moved by the promise of better food and demanded a review of all political trials and removal of barbed wire. The commission offered only minor concessions: two letters home a month (instead of two a year), one visitor a year and the removal of identification numbers from clothes and iron bars from barrack windows. In an open letter, the strike leadership rejected these concessions. Better food, higher pay and shorter shifts were then promised, but only a few strikers wavered. Although in most camps, the strikers acted in an organized and effective way, so as to avoid violence and repression (by preparing declarations and other official documents listing the prisoners’ complaints and demands – which included releasing certain categories of prisoners, the right to write letters once a month, and removal of numbers from their uniforms , organizing large assemblies, and staging peaceful occupations of main buildings in the camp), the authorities responded amiably only up to a certain moment. The meeting with the Moscow commission had ended with the authorities promising to return with answers in two days (answers which, most committee members hinted, would be positive). On the morning of August 1, though, most officials in the commission (who had been present at Vorkuta and spoken to the prisoners) came back accompanied by generals and guards and met with a few thousand prisoners assembled at the gates. The officials ordered the prisoners to go back to work immediately and made no reference to their demands. Their prompt refusal motivated one of the commission leaders to take out his gun and shoot at the leader of a prisoner committee, thus giving the signal for a brutal assault which ended the Vorkuta strike (although not all camps within Vorkuta were directly involved in the violence, the repression triggered a chain reaction and ultimately all camps surrendered one by one), also influenced by food and fuel shortages. The consequences of this historic resistance arguably led directly to the gradual emptying of the forced labor camps, which not only encompassed Vorkuta, but also Norilsk (Russia's nickel enclave on the Kola Peninsula) and others. However, dissidents were still being thrown into the camps well into the 1960's. The strike itself was remarkable as an example of nonviolent action as it was organized entirely underground by prisoners who had no rights and under the strict surveillance and threat of repression by camps authorities and by the NKVD (the Russian Secret Police). This campaign was influenced by the East German revolt in June 1953 (1). This campaign influenced other prison strikes throughout the Soviet Union (2). Carter, A. Non-violent Action: a Selected Bibliography. London, Housmans; Haverford, Pa., Center for Nonviolent Conflict Resolution, Haverford College, 1970. The strike in July 1953 could not have occurred without the previous underground formation of resistance groups within the camps. Yet the strike as it occurred was entirely different from the action planned previously. Prior to June 17 all the preparations for resistance to the totalitarian rulers were based on the eventuality of war and therefore looked to the Western rulers. When Stalin died in March 1953, hope spread through the camp, but the West did not respond to these expectations. The East German revolt gave the Vorkuta prisoners an example of workers attempting to achieve their own liberation through their own strength. The Vorkuta strike and other similar ones contributed to the destruction of the Soviet myth of invincibility. The workers’ action shook the Kremlin to its very foundations, by affecting the cost of coal and forcing authorities to acknowledge that the country had no reserves, therefore putting an end to the illusion that the system was unassailable. The Vorkuta strike and other similar ones seemed to work well as a means of promoting dialogue. Rather than immediately exert force to break the strikes, the camp authorities temporarily adapted to the new situation, for example: by providing the usual food rations. Their responses were influenced by political uncertainty in the aftermath of Stalin's death. Visits to the camps by a commission from Moscow represented the success of the strikes in inducing the authorities to engage in dialogue.